A Victorian era boat, evidence of Kashmir’s historic connections with the British empire, is decaying and rusting in an open parking lot of SPS Museum here. The boat was a gift from Queen Victoria of United Kingdom, who was coronated in 1838 and remained the Empress of India from 1876 until her death in 1901, to Maharaja Ranbir Singh, a monarch who ruled Jammu and Kashmir from 1857 to 1885. In today’s Kashmir, this royal gift is withering in sun, snow and rain as it remains lying in the open parking lot of the Sri Partap Singh Museum, named after the Maharaja’s son. What remains of the nearly 30-feet-long boat, which is up to eight feet in width, is the rusted decaying structure. The entire body of the boat is covered with rust, at places several layers deep, and a large hole has damaged the lower frontal part of it. Several smaller holes, of the size of a football, have also punctured the boat at its bow and stern. The museum has no details about the year when the boat was gifted and when it reached Kashmir. From the timeline of the two rulers, the boat was gifted to the Dogra king of Kashmir anytime between 1857 and 1885, when he was the Maharaja. A marker on the boat, which has words engraved on it, is the only testimony that it was exchanged between the two Royals. “Presented by H.M. Queen Victoria to H.H. Shree Maharaja Ranbir Singh Ji Bahadar,” the text — on the marker, which is a sort of an epitaph — in bold capital letters reads. The initials mentioned in the text – H.M. – meant ‘Her Majesty’ as the Queen of United Kingdom was called and H.H. meant ‘His Highness’, then attributed to the dynastic heads of the major princely states. The only detail available in the museum records show the boat was transferred to the museum from Tosh Khana, treasury of the Kashmir’s erstwhile monarchs, in 1987. Since then the boat remained decaying, year after year, in a damp pit, adjoining the main museum building, until the construction for a new building began when the pit was filled, leading to boat’s relocation to a new spot — the open parking lot. “We have a proposal with the government to have a glass fibre cover for the boat,” the curator of the museum, Mushtaq Ahmad Beigh,said. He said the glass fibre cover will be in place once a permanent spot is decided for the boat. “We have to wait for the designer to decide the spot,” Beigh said. The designers, a Mumbai-based interior designing consultancy, has been tasked to design the new building, which is under construction for the last five years. To the naked eye, it’s just a piece of rusty junk. But look closer and you’ll find this rusty boat is of royal lineage. Blue blood couldn’t be thicker. 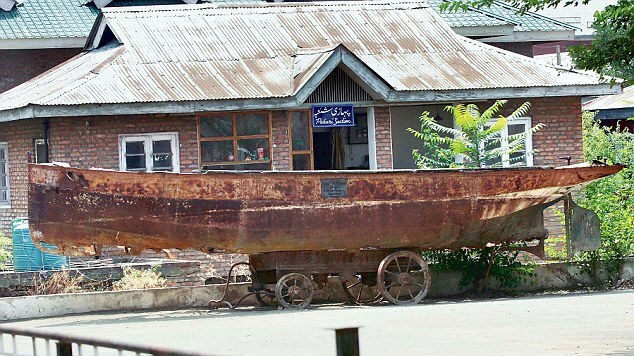 But this Victorian-era boat, which reflects Kashmir’s connection with the British Empire, has been kept in a parking lot at Sri Pratap Singh (SPS) Museum in Srinagar. The already rusty piece is thus open to the ravages of the elements. Ranbir Singh, a Dogra Maharaja, ruled Kashmir from 1857 to 1885. Queen Victoria, who was crowned in 1838, remained Empress of India from 1876 to 1901. Mushtaq Ahmad Baig, the curator of the museum, said the boat will be shifted to a new museum whenever it is open. The new museum was built by Ghulam Nabi Azad when he was the chief minister of the state in 2007. Azad used to personally monitor the progress of the museum. The building came up in a record six months time and finally Azad laid its foundation stone on March 20, 2008. He had set an 18-month deadline to complete the interiors of the building. Azad wanted to throw the museum open during his tenure but couldn’t, thanks to his premature exit from the government in the wake of the protests against transfer of land to the Shri Amarnath Shrine Board and subsequent withdrawal of support by coalition partner People’s Democratic Party(PDP). The museum hasn’t been opened to public since then. The present SPS Museum has been declared as an unsafe building. Maharaja Pratap Singh had established it in 1898 in his guest house at Lal Mandi. The SPS Museum houses a precious collection of archaeological excavations, ancient coins, seals, terracotta, inscriptions, paintings, shawls, stuffed birds and animals and silver and bronze utensils of different civilizations. But the delay in the completion of the new building has hampered its shifting. ‘It is sad that the royal boat is in the open. It should not have been there at the first place. ‘But because of lack of space in our old museum, we have no alternative,’ Baig said. The curator also said that a number of artifacts mostly stones, have been kept in the open as they would not face any damage. ‘We have kept less important things of archival value in open air. ‘But once the new museum is handed over to us, we will select a proper space for the boat and cover it with fibreglass.’ Baig added. Muhammad Yaqub ( who actually was a Fort Commander of Kashgarh) sent Yakub Khan Tora as an envoy to Maharaja Ranbir Singh of Jammu and Kashmir in 1871, with the request that the British Government in India could be persuaded to enter into a political alliance with him. Maharaja Ranbir Singh supported his request. 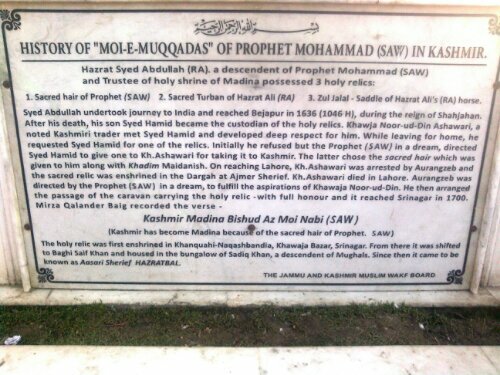 From Srinagar, Yaqub Khan went to Constantinople (now Istanbul), There he agreed to the recitation of the Khutba in the name of Sultan Abdel Aziz of Turkey in the mosques of Kashgarh, i.e Sultan Abdul Aziz as the Khalifa of the Muslims of Kashgarhia. Sultan Abdul Aziz gave Muhammad Yaqub the tile of Amir ul Moomineen, ‘Commander of the Faithful’, i.e the Muslims. Lord Thomas George Baring Northbookof Stratton, the Viceroy and Governor-General of India (Calcutta) from 1872 to 1876, appointed Thomas Douglas Forsyth to conduct a mission to Yarkand, Kashgarhia. The staff, native assistants of the Forsyth Mission included Nain Singh & Kishan Singh – the surveyor pandits of Survey of India. Yakub Beig who was on his way back from Constantinople, accompanied the Forsyth Mission. British India and Kashgarhia concluded their treaty of commerce at Kashgarh on 2nd February 1874. Queen Victoria sent a small steam boat to Maharaja Ranbir Singh for his services to the Forsyth Mission. 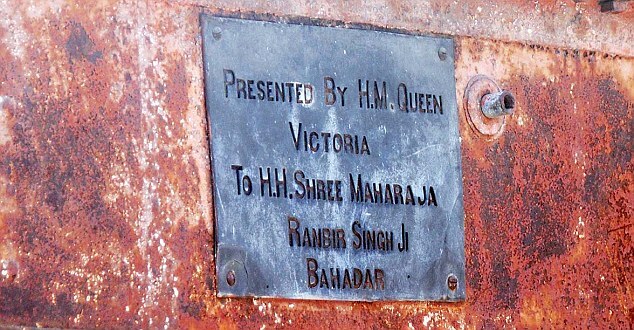 So from the excerpt of the book, it is clear that Queen Victoria had given the gift of Steam Boat after February 1874 to Maharaja Ranbir Singh. In a minor degree we were so fortunate as to see it in its greatest perfection, even if shorn of some of its former elegance, as we were bidden to a fete within its walls, given by the Maharajah in honour of the launching of a small steam-vessel upon the lake. This event, and the subsequent festivities at the Shalimar, were very diverting to us, and, by way of concluding the description of the Dal lake, a short sketch of that memorable day in the history of Kashmir may very well here find a place. A memorable day indeed it was to the inhabitants of the Valley, and long talked of both before and after ; for steam power was a mystery to them, and never before had the mountains surrounding their homes echoed back the sound of the whistle, the shrill scream of that invention which proves wherever it is introduced the most civilizing agent, and the most potent uprooter of old ideas and prejudices known to man. At an early hour of the day which was to mark the first step of the onward march of progress in Kashmir, the city was full of people, and the river crowded with boats of every size and description. The entire population of the Valley were gathered together, all thrilling with excitement, and all actuated by the same motive, that of getting as good a place as possible near the scene of action, so as to obtain a sight of that mystery of mysteries, a boat moving over the water without the usual, and to them well known, agency of hands. Their first introduction to this new and unknown motive-power being made in connection with a boat one of the institutions of the country, and with the working of which all were familiar undoubtedly explained the great interest taken in the proceedings by both young and old ; for I question if the first essay had been a piece of machinery applied to any other purpose half the curiosity manifested would have been aroused. But to move a boat was intelligible enough, although the means employed were incomprehensible ; and already hopes were aroused and visions were opened of the day when the weary work of towing and paddling should be a thing of the past, and their floating homes should walk the waters, like things of life, without any exertion on their part. If applied to the vessel they were about to see, why should it not be applied to all and sundry ? Full of these hopes and aspirations, and bursting with curiosity, the people all .wended their way, hours before the time fixed for the ceremony, to that portion of the lake devoted to its performance, and soon the capital presented a deserted and forlorn appearance. proper element some time before. The boat itself was one of the steam-launches usually carried by the ships of the Royal Navy, and was a present to the Maharajah from our gracious Queen, having been sent to his country in pieces, which were finally put together, under the direction of a European engineer who accompanied the gift, and who remained in charge to instruct the recipient and his attendants as to the management of the machinery. watery highway of the city, looking as pleased as a child with a new toy, much to the delight of his faithful subjects, who clustered like bees on every commanding point that afforded a view of the royal progress. Thus it is clear that the steam engine presented by Queen Victoria to the Maharaja Ranbir Singh of Jammu Kashmir was in the summer of 1875 for his services to the Forsyth mission. It was in the year 1877 that on behalf of Maharaja Ranbir Singh of the princely state of Jammu & Kashmir, the Indian Telegraph Department supplied the first telegraph line between Srinagar and Gilgit. Telegraph line between Jammu and Srinagar was completed in May 1878. At 4pm, 1878, Maharaja Ranbir Singh personally had visited the Jammu Telegraph office. Telegraph line from Srinagar to Gilgit was completed & opened in 1894. I. The Treaty of 1878. (a) That the transport of all telegraph materials from Sealkote to the Cashmere frontier and within the limits of the Cashmere State shall be directly arranged and paid for by some duly authorised officer of the Cashmere State. (b) That all labourers, whom the officer in charge of the construction of the line shall require to employ, shall be engaged and paid by a duly authorised officer of the Cashmere State. (c) That on due notice being given by the officer in charge of the construction of the line, the Cashmere Government shall, to the utmost of its power, comply with requisitions for transport or labour. (d) That sound seasoned deodar posts, where these are procurable, suitable for telegraph supports, shall be provided by the Cashmere State and distributed along the route to be taken by the telegraph lines, in such manner as the officer in charge of the work may direct. (e) That no bracket or insulators be used in the construction of the lines, as their cost has not been provided in the estimated amounts stated above. 2. The British Government guarantees that all telegraph materials, including the wire supplied by it, shall be of the best quality used for its own lines, and that the lines shall be handed over the Cashmere Government in full working order. (b) The cost of insulating the line, or of any other charges in the original scheme that may be made hereafter with the concurrence, or at the request of the Cashmere State. 4. The salaries and allowances of all members of the Indian Telegraph establishment will be paid to them by the Government of India through the Officer on special duty, and the amounts of such payments will be recovered subsequently from the Cashmere State. 5. On the application in writing of the Cashmere State, the Telegraph Department will supply at cost price all telegraph instruments and material required from time to time for the maintenance and working of the telegraph lines and offices about to be established. 6. On the application in writing of the Cashmere State, the Telegraph Department will afford such advice and instruction as may be required and desired by the Cashmere State for the maintenance and working of such telegraph lines and offices. 7. On the application in writing of the Cashmere State, the Telegraph Department will lend the services of any Native signallers, who may volunteer for the duty, and whose services can be spared, for such specified periods as may be sufficient to enable the Cashmere State to train its own signallers. 8. The foregoing provisions are accepted by the British Government as a mark of friendship and good-will towards His Highness the Maharaja; but it is to be understood that after the lines are delivered over [to] the Cashmere Government, no responsibility whatever attached to the British Government in respect of their subsequent maintenance and working. (Sd.) P.D. Henderson, Major. Officer on special duty in Cashmere. (Sd.) Nilumber Mookerjee. Judge of the Sadr Adalut of Cashmere. The 9th March, 1878. II. The Treaty of 1890. In 1890 a further agreement was entered into by the two Governments for the maintenance and working of a third line of telegraph along the State Railway from Suchet Carh to Jammu. It was signed at Gulmarg on 3rd July, 1890, by R. Parry Nisbet—British Resident in Kashmir, and by Raja Amar Singh—Prime Minister and President of the Jammu-Kashmir State Council, being further approved and confirmed at Simla some three weeks later.